MONDAY, NOVEMBER 23, 2009 AT 6:15 P.M.
4. 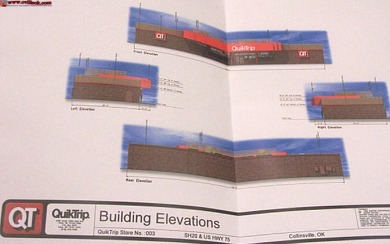 Presentation from Pamela Friggel with Quik-Trip Corp. -- Friggel was not present but Ricky Hayes (Retail Attractions, LLC) discussed Quick-Trip's letter of intent (received mid-November) stating their intent to build a 4600 sq-ft building at Hwy 75/20 (and 16 gas pumps & kitchen). The facility should be similar in size to the Quick-Trip at 76th St N. in Owasso. Hayes estimated the facility might be completed in 8 to 9 months. Hayes stated Quick-Trip would also be building 4 other facilities in the Tulsa area. 5. Discussion, consideration and possible action to approve plans to expand sanitary sewer services to the west side of the Citys corporate limits. -- approved proceeding with a $2.5 million option to build a sewer system using a combination of gravity and a pump station to serve the Highway 20 corridor west to Highway 75. Jay Updike presented the options and expected the plans in about 90 days and 9-12 months to complete. 6. Discussion, consideration and possible action authorizing the Baker Group, as financial advisor and Johanning and Byrom, P.C. as bond council, to prepare and present financing plans and legal documentation to implement the financing of the sewer expansion project. 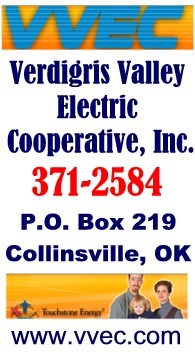 -- approved to generate financial options to present to the City at the Dec. 7th meet. The city's recent A rating for the bonds for the sales tax improvements is expected to speed the process for this financing. Low construction cost and interest rates (and potential growth potential residential/commercial) were cited as making this a good time to take on the $2.5 million expense.